We offer a variety of training for parents e.g. Know where to find information and support on children’s communication development. 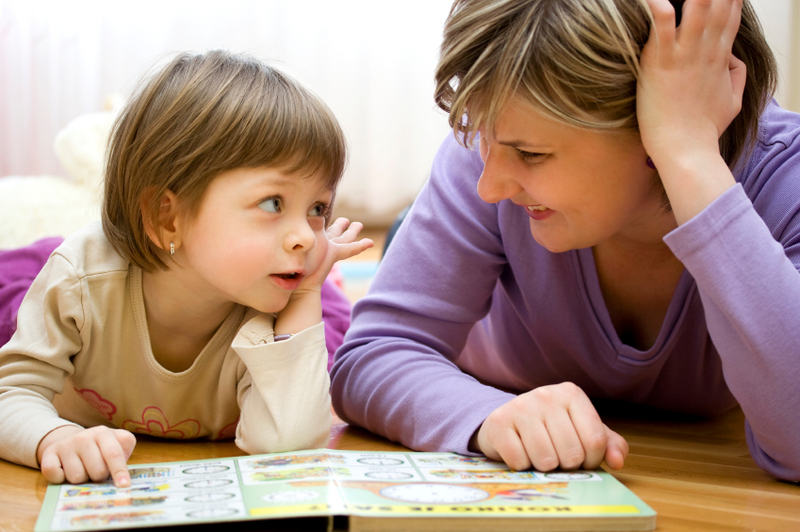 Lets talk with Under 5's is an accredited course delivered over six two-hour workshops with an optional seventh which explores phonology. This course is relevant to parents, carers (including child minders) and pre-school practitioners wanting some key skills and knowledge. Completion of this course can lead to exploring the issues involved in more depth by attending our Speech and Language Support for Under 5's ten week course. Support needed to complete the workbook to achieve accreditation at level 1 though the Open College Network. Play; the link between play and language. Gain recognition for taking part in the course by recording your ideas, observations and activities in a booklet. You can gain a certificate from the Open College Network South West which is part of Plymouth University. This could help you with employment opportunities. You will be given support and encouragement to achieve this goal. The It Takes Two to Talk Program is designed specifically for parents of children ages five and under who have been identified as having a language delay. In a small, personalized group setting, parents learn practical strategies to help their children learn language naturally throughout their day together. The It Takes Two to Talk Program teaches you, step-by-step, how to become your child’s most important language teacher. Why Take the It Takes Two to Talk® Program? As a parent, you know how challenging it can be for your child with Autism Spectrum Disorder to interact meaningfully with others and connect with the world around him. The More Than Words Program was designed specifically for parents of children ages 5 and under on the autism spectrum. Addressing the unique needs of these children, the program provides parents with the tools, strategies and support they need to help their children reach their full communication potential. During the More Than Words Program, you’ll use the guidebook More Than Words: A Parent’s Guide to Building Interaction and Language Skills for Children with Autism Spectrum Disorder or Social Communication Difficulties.This guidebook covers all of the strategies from the More Than Words Program and offers dozens of examples for how you can use these strategies during everyday routines and activities with your child. Even after completing the program, you can keep coming back to this guidebook to remind yourself of what you have learned and to get new ideas and support as your child progresses and new goals are set. If you are waiting to attend a More Than Words program, you may want to purchase the guidebook in advance to give your learning a head start and to gain some practical strategies that you can start using with your child right away. Learn more about the More Than Words guidebook. The More Than Words Program focuses on your natural, day-to-day life with your child. You’ll discover how to take everyday activities like meal time, story time and bath time and use them to help your child improve his communication and social skills. And you’ll have fun together while you’re doing it! The More Than Words approach is easy to understand and easy to put into practice. With every strategy you learn, you’ll be given ample opportunity to practice and discuss it so that you won’t forget it. Keep it fun! Keep it going! The R.O.C.K.™ strategy can be used during any activity you do with your child to foster longer, more meaningful interactions and improved social skills. Like all of Hanen's programs, More Than Words was developed by expert speech-language pathologists and is grounded in extensive research. The program itself is delivered by Hanen Certified Speech-language pathologists who have completed specialized training from The Hanen Centre. More Than Words requires a significant time commitment from parents in order to ensure the best possible learning experience. Once you’ve completed the program, however, the strategies you’ve learned will become such a natural part of the way you interact with your child that you won’t even notice you’re using them. The commitment you put in now will pay off during every interaction you have with your child.